The rise of specialty pharmacy spend and trend can be traced back to the work of pharmaceutical manufacturers determined to provide targeted biological treatment for complex medical conditions. We must now count on these same manufacturers to create the competition necessary to provide these innovative treatments in an affordable manner. Many payors searching for a special cure for their specialty spend have their eyes set on biosimilar medications. Before discussing strategies to maximize prescription competition, let’s dive into some fundamentals on biologic drugs and the current issues limiting the potential biosimilar market. Biologic drugs, such as vaccines, insulins, and gene therapies, are intricate medications made from living cells typically given through injection or infusion to treat conditions such as cancer, diabetes and rheumatoid arthritis. 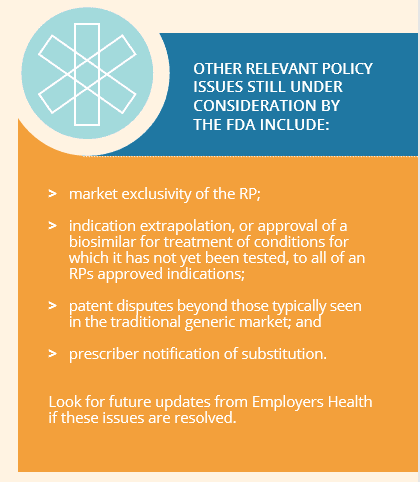 The complexity of the manufacturing process hampers the ability of biosimilars to be true generic equivalents, but this does not mean a biosimilar cannot be considered highly similar or even interchangeable with, meaning substituted by a pharmacist without provider notification, the reference product (RP). Through the Biologics Price Competition and Innovation (BPCI) Act of 2009, two pathways emerged for biologic products to compare themselves to the RP. At least 59 biologics for 18 RPs are on the “biosimilar to” path towards approval, but none have gone down the “interchangeable with” route. The discrepancy is largely due to the lack of clear guidance from the FDA regarding what additional information it will need to evaluate interchangeability. This guidance is anticipated at some point during 2017, but as of now, only biologics deemed biosimilar and interchangeable may be substituted by a pharmacist without intervention as would a traditional generic drug. Even without interchangeability, a product considered biosimilar must show no clinically meaningful differences in safety and effectiveness to the RP. If you replace biosimilar with generic and RP with brand drug in the last sentence, we can get a sense of why some plan sponsors may want to utilize strategies for biosimilars that have worked to lessen trend on the traditional side of prescription drugs. With that said, the complex differences in the manufacturing process between chemical drugs and biologics cannot be understated. The production of the average generic drug costs $2 million to $5 million over two to three years, while the developmental cost of a biosimilar is currently around $75 million to $100 million for five years. This gap is why many experts believe the percent savings driven by biosimilars should be tempered to roughly 20 to 30 percent of the RP’s cost until enough multisource-biosimilars are on the market. The large investment necessary to produce a biosimilar has led to much policy debate over naming rights of the product, as you may imagine. In Europe, where 19 biosimilars have been approved, the drugs must be identified by their brand name instead of by their International Nonproprietary Name (INN), which is the globally recognized generic name for the active ingredient. Naming for the two biosimilars approved in the U.S., Zarxio™ (filgrastim) and Inflectra™ (infliximab), has followed the European lead and will continue to do so unless the FDA recommends otherwise. While the number of biosimilar products available currently is extremely limited, it is in a plan sponsor’s best interest to be prepared once the market has more competition. Plan design, utilization management, formulary selection and prescriber and patient education can all play a factor in receiving the lowest net cost of care under both the pharmacy and medical benefits. It is worth noting that Inflectra™ is the biosimilar approved, but not yet on the market, for Remicade© (infliximab), which is the top costly drug dispensed under the medical benefit for many employers. For those groups that have adopted a fourth tier for specialty copays, it may be time to split that tier into two to differentiate between branded biologics and RPs (Tier Five) while incentivizing plan participants towards biosimilars as well as the numerous generic specialty drugs (Tier Four) that have reached the market over the last few years. A potential design could be a Tier Four copay of free or 50 percent of Tier Five, which should generally not be over $100 to $150 per 30-day supply to avoid negatively impacting adherence. Tying in utilization tools such as prior authorization (PA) and step therapy (ST) to the separated specialty copays would make for the ultimate plan design, but even without the tiered copays, PA and ST should be the mainstay of specialty pharmacy management already. However, this may not be the case under the medical benefit, especially at the outpatient hospital setting, so it is important to discuss biologic drug utilization management with your health plan provider. Exclusionary formularies are another valuable tool in reducing spend for specialty products. A common misconception that leads to less adoption of exclusions is that a patient’s access is completely eliminated to an excluded product. In fact, most PBMs offer a PA process for medical necessity to show that the preferred product does not fit the patient profile. Starting in 2017, CVS/caremark will be the first PBM to prefer biosimilar products over excluded RPs with the belief that lowest net cost can be achieved through higher discounts and rebates. We expect the other PBMs to follow suit once more biosimilars hit the market, but do not be surprised if biosimilars are excluded in favor of RPs in the future in favor of enhanced rebates. Grandfathering of patients on RPs is not recommended either because biosimilars are considered therapeutically equivalent to RPs. The specialty pharmacy care team staff could assist any patient with getting back on the RP if he or she is experiencing any difficulties with the biosimilar, which should make a move to prefer biosimilars more palatable for human resource managers. This also highlights the importance of the partnership needed with your PBM and health plan to provide proper education on transitioning to a biosimilar on both the patient and prescriber level. In summary, biosimilars have the potential to provide significant savings to plan sponsors and their participants struggling to curb the cost of prescription drugs. Manufacturers of both biosimilars as well as RPs have the opportunity to invest in a competitive marketplace necessary for sustainable benefits, but it likely will require the FDA to be the guiding catalyst of this movement. For reference information or to discuss further, please contact Matt at mharman@employershealthco.com. In his role at Employers Health, Matthew is primarily responsible for monitoring and evaluating the pharmacy plan performance of member organizations that participate in the collective strategy purchasing programs with CVS Caremark and OptumRx.